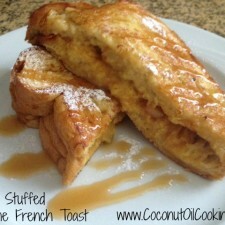 Apple Stuffed French Toast - Yum! Mother’s Day is right around the corner and with that said, I’m already planning on making this day special. I have kept it a tradition to make breakfast for my mom each year, even if I’m grown up and living on my own. Since making breakfast is always pretty inexpensive and a nice gesture at any age, I wanted to put together my favorite recipes that are great for Mother’s Day! All of the recipes below use coconut oil as a replacement for butter or oil, which helps bring out flavor and is also a healthier option. With any recipe, you replace coconut oil for butter or oil in a 1:1 ratio – it’s that easy. I promise that you won’t be disappointed in the flavor combinations, especially on pancakes! Here are a few recipe ideas to get you started for this upcoming Mother’s Day. Ham and Cheese Quiche – For those who love eggs, this ham and cheese quiche recipe hits the spot! I decided to go crust-less with this quiche to save on calories, but you still get an insane amount of flavor. All of the ingredients come together to form a light, but delicious breakfast dish. 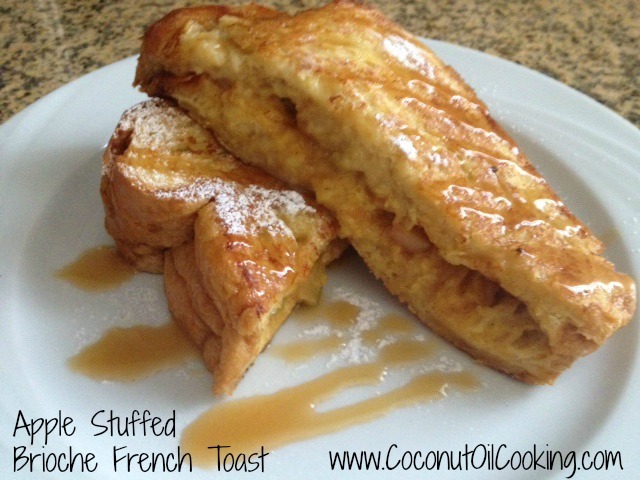 Apple Stuffed French Toast – You can never go wrong with French toast, but adding apples and caramel brings the traditional recipe to another level! This sweet breakfast idea is perfect for a nice sit-down morning and would go great with orange juice or mimosas. Banana Chocolate Chip Pumpkin Pancakes – This gluten-free recipe uses banana, pumpkin, and coconut oil to make these pancakes so fluffy and flavorful. The addition of chocolate chips helps give just the right amount of sweetness and is perfect to share with little ones, too! Blueberry and Coconut Bars – For mothers who don’t like to eat a big breakfast, these blueberry and coconut bars are perfect for a small way to start the day. You get just the right amount of fruit flavor incorporated with a delicious crust. Belgian Waffles – This simple recipe makes the some of the best waffles that I have done myself! At the very end, try drizzling coconut oil on top with maple syrup – you can’t go wrong! You can also add any fresh fruit or chocolate chips to this recipe to spice things up. Hopefully one of these recipes will be the perfect breakfast to make for your mom on Mother’s Day! For more ideas, be sure to visit this blog for great DIY Mother’s Day Gifts.